The iFP-395T combines unique iRiver styling with an impressive list of advanced features: 512MB of internal memory, an integrated FM tuner, voice and FM recorder, sport arm band and neck strap, Sennheiser earphones and up to 24 hours of battery life on a single AA. Fill one up with your favorite music or use it as a portable drive to transfer files of any type. 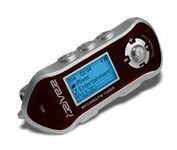 Plus, the real-time MP3 encoding feature allows you to connect the player to your home stereo or portable CD player to encode MP3 files directly to the iFP-395T without a PC.